After spending time learning how to build a resume and cover letter that shine a bright light on your accomplishments, being asked to unearth an unflattering story about your professional life can feel defeating. Answering these questions is a delicate balance: You want to give them something of substance – a real failure that had real consequences. At the same time, you also want to look like a capable person who is good at their job. So, how do you balance those two seemingly-opposing objectives? Why Am I Being Asked About Past Failures? Hiring managers aren’t trying to disqualify you when they ask interview questions about mistakes you made and failures you’ve been through. Rather, what they are hoping to glean is whether you have insight into the consequences of your actions and whether you are someone who is capable of learning from failure. Questions about past failures fall under the category of behavioral questions. 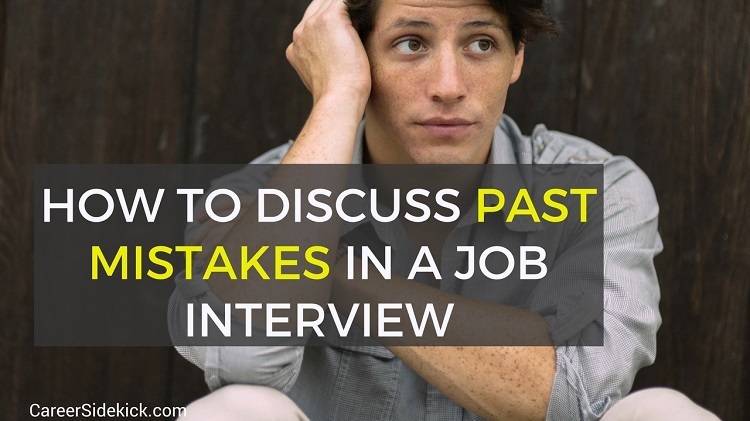 These interview questions operate on the premise that the best way to predict future behavior is to examine past behavior. Therefore, if you can cite an example of past failure and what you’ve learned from it, a recruiter will see you as a person who is capable of learning a lesson from a mistake. The way you answer this question also says a lot about your level of personal responsibility. No one wants a coworker who is constantly passing the buck and blaming their blunders on others. Being able to stand up, own your mistakes, and offer up a sincere mea culpa is a sign of confidence and integrity. Also, the ability to reflect on the lessons you learned through failure is evidence of growth. After all, if you can’t point to a failure, you may be a person who isn’t willing to take risks. This is critical information in some industries, like tech, that are interested in hiring innovative people. Everybody fails at work. It’s just a fact of life. The trick to answering a question about a past failure is to choose an example that shows you are a human who errs, and also that you are a person who learns from their mistakes. Like every other part of a job interview, the goal is to show that you are smart and insightful about how your actions impact the organization. A humblebrag is a statement that is designed to sound modest but that actually highlights something that you are proud of. Answering a question about failure with a thinly-veiled self-congratulatory story won’t fly. You need to choose a real example of failure and then explain the lesson you learned from it. Below are two possible responses. To succeed in answering a question about a past failure, pick a story that ends with a compelling lesson. Ideally, you should briefly outline the mistake and then elaborate on the lesson learned and how you’ve applied it to other projects. You should never babble during a job interview, but brevity is very important when you are describing a recent failure. Don’t tell a longwinded story. Your Ill-Advised Action + Poor Result = Lesson Learned. Always use a real past failure example but do your best to make it benign. In other words, don’t give the employer a reason not to hire you with the example you choose. A company is not going to hire a person who might create a fiasco or present a legal problem for them down the road. Remember failure isn’t fatal. Just focus on the lesson you learned from your mistake.